Dr CA Davie, NMR Research Unit, Institute of Neurology, Queen Square, London WC1N 3BG, UK. OBJECTIVES To test the hypothesis that irrecoverable neurological deficit in multiple sclerosis is associated with axonal loss. METHODS 1H magnetic resonance spectroscopy (MRS) was carried out in a group of patients with clinically definite multiple sclerosis (n=31). Using this technique, the apparent concentration of NA ([NA] the sum of N-acetyl aspartate (NAA), a neuronal marker, and N-acetylaspartylglutamate has been compared in four groups of patients with multiple sclerosis classified as relapsing-remitting, secondary progressive, primary progressive, benign, and a control group. RESULTS In the patients with relapsing-remitting disease (n=9) there was a highly significant reduction of apparent NA (median 8.73 mM, range 6.86 mM-10.74 mM, P=0.0008) from an area of high signal compared with the control group (median 11.97 mM, range 10.55 mM-14.5 mM). In the patients with secondary progressive disease (n=10), there was again a highly significant reduction of apparent NA (median 7.82 mM, range 3.5 mM-10.3 mM, P=0.0003) from an area of high signal compared with the control group. In the patients with primary progressive disease (n=6) there was once again a highly significant reduction of apparent NA (median 8.83 mM, range 6.95 mM-9.89 mM, P<0.002) from an area of high signal compared with the control group. In the patients with benign disease, however, there was no significant difference in the apparent NA (median 10.5 mM, range 8.53 mM-12.8 mM, P>0.05) from an area of high signal compared with the control group. In the patients with benign disease (n=5) there was also no significant difference in the apparent NA (median 10.74 mM, range 8.58 mM-13.4 mM, P>0.3) from an area of normal appearing white matter compared with the control group. In the patients with primary progressive disease, however, there was a significant reduction of apparent NA from an area of normal appearing white matter (median 8.78 mM, range 8.7 mM-12.38 mM, P< 0.025) compared with the control group. There was a significant inverse correlation between [NA] from lesions in the patients with multiple sclerosis and disability as measured on the Kurtzke expanded disability scale score (r= -0.364, 0.05>P> 0.02). CONCLUSION These findings support the hypothesis that axonal loss is important in the development of disability in multiple sclerosis. They also provide evidence for axonal loss in normal appearing white matter in patients with primary progressive disease. Although conventional MRI is sensitive in detecting the lesions of multiple sclerosis, it disclosed neither demyelination nor axon loss itself. 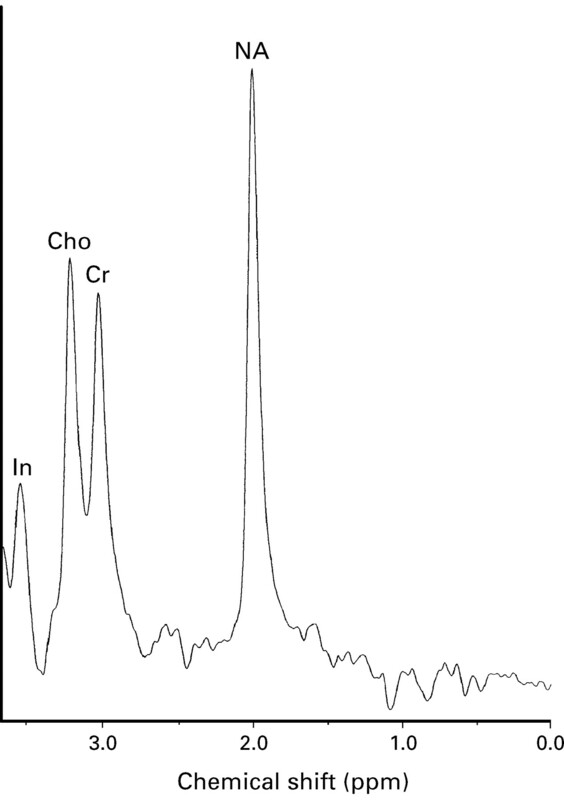 Proton magnetic resonance spectroscopy (MRS) is a nuclear magnetic resonance technique which has the potential to detect axon loss non-invasively during life. 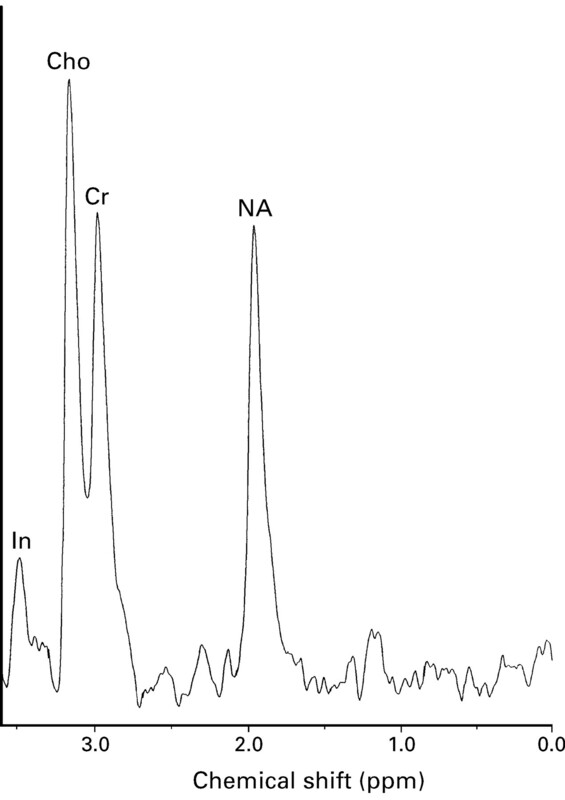 The normal proton spectrum is dominated by N-acetyl derived groups (NA; the sum of N-acetyl aspartate (NAA) and N-acetylaspartylglutamate).7 The predominant component of the NA peak is NAA, an amino acid of unknown function which has been shown in experimental studies on neonatal rats to be contained almost exclusively within neurons.8 A loss of neurons (cell bodies and axons) would be predicted to cause a persistent reduction in the concentration of NAA. That this is so has been shown in diseases characterised by neuronal loss.9-12 To test the hypothesis that irrecoverable neurological deficit in multiple sclerosis is associated with axon loss, the apparent concentration of NA has been compared in four groups of patients classified as relapsing-remitting, secondary progressive, primary progressive, and benign. Patients with clinically definite multiple sclerosis13 were recruited from the National Hospital for Neurology and Neurosurgery. The study was approved by the joint ethics committee at the Institute of Neurology and the National Hospital for Neurology and Neurosurgery, London. Informed consent was obtained from all patients before each study. (3) Secondary progressive disease (n=10): these were patients presenting with a relapsing-remitting course with evidence of progressive deterioration for at least six months with or without superimposed relapses. They had a median age of 46 (range 21-55) years and a median disease duration of 13.5 (range 5-25) years. 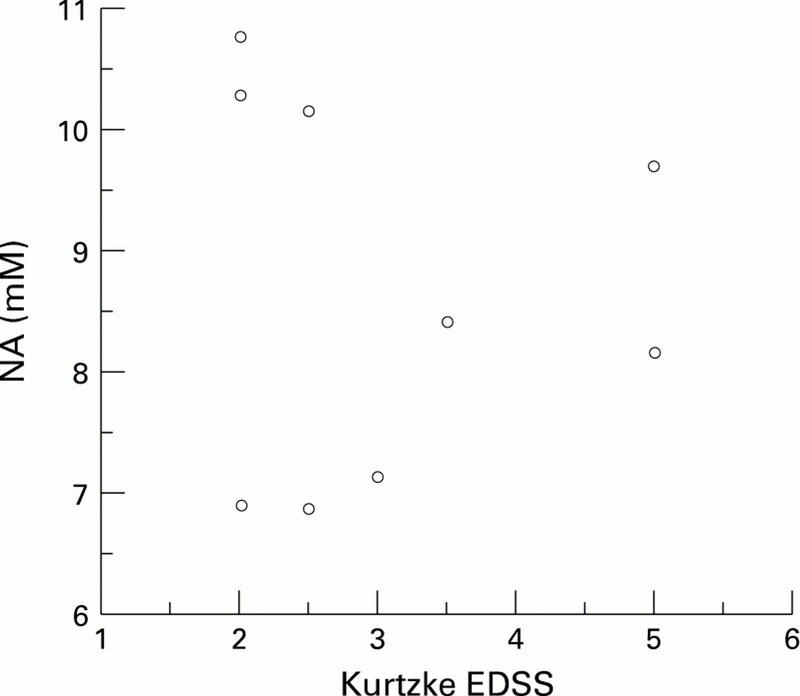 The median Kurtzke EDSS was 7.0 (range 4.0-8.0). Nine healthy controls were also studied (median age 40 (range 18-57) years). The controls were recruited from members of staff at the National Hospital for Neurology. Brain MRI and MRS were performed with a 1.5 T GE Signa whole body scanner using a standard quadrature head coil. The study commenced with a T2 weighted fast spin echo imaging sequence (TR 3000 ms, TEf 80 ms) (5 mm slices with 2.5 mm gap, 256×256 matrix, echo train length 8 ). After imaging, a volume of interest ranging between 3.5 ml and 6 ml was prescribed which in the patient group incorporated a chronic high signal lesion or an area of normal appearing white matter. Lesions were determined to be chronic if they were unchanged on imaging over a period of six months or greater. Large lesions were chosen to minimise partial volume effects. If a sufficiently large enough lesion could not be identified on imaging then spectra were collected from normal appearing white matter alone. In several of the patients it was not possible to collect spectra from an area of high signal and normal appearing white matter because of time constraints and patient compliance. An MR image of the voxel was then obtained to ensure accurate localisation. 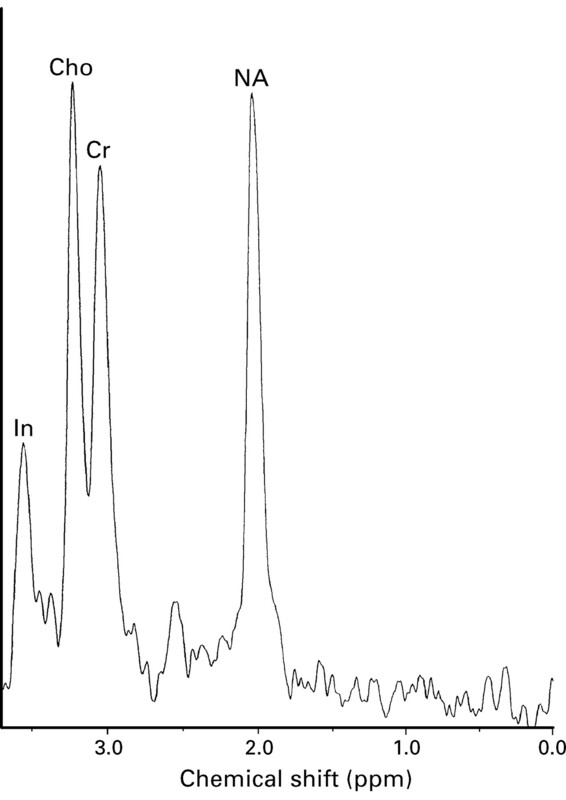 Water suppressed 1H spectra were obtained using a STEAM sequence.14 15 Acquisition indices were TR 2000 ms, TM 12 ms, and TE 135 ms; 256 averages were collected using an eight step phase cycle in about nine minutes; 1024 points were collected, with a spectral width of 750 Hz. Shimming to a line width of about 1.5 Hz. and water suppression were reoptimised for each new location. In the control group, spectra were collected from an area of periventricular white matter similar in volume and site to the lesions studied in the multiple sclerosis groups. where S0 MET and S0 H2O denote the signal intensities for metabolites and water respectively, [H2O] is the brain water concentration from the volume of interest. The water concentration from the voxel of interest was calculated by comparing the signal intensity from the proton density images in the putamen with the region of interest in the hemispheric white matter. The putamen was chosen as this region of the basal ganglia is not affected by deposition of heavy metal in healthy controls.17 Furthermore, a recent study by Grimaudet al 18 has shown no evidence of hypointensity on T2 weighted images to suggest increased deposition of heavy metals in the putamen of patients with multiple sclerosis. The water concentration of normal appearing grey matter has been taken as 45.5 M.19 In the control groups the concentration of water in white matter has been taken as 39.75 M.19T1corr and T2corr are T1and T2 correction values based on published T1 and T2 times from parietal white matter for the metabolites studied.20 As absolute T1 and T2 values were not calculated for patients and controls, the term apparent concentration is used. 2/PI denotes the proton index and refers to the number of protons in each metabolite (three for NAA, three for creatine, nine for choline) The value of 2 represents the two protons in H2O. R = R metabolite-R waterand accounts for different receiver attenuator settings. Statistical analysis was performed with a Mann-Whitney confidence interval and test. Results are expressed as a median value together with the range and P value. A Spearman’s rank correlation test was also used and results are expressed as an r value together with levels of significance. 1H MRS (TE 135 ms TR 2000 ms, volume 4 ml) from periventricular parietal white matter in a healthy 40 year old control). All patients in the relapsing-remitting and secondary progressive groups had lesions large enough to be studied with single voxel spectroscopy. In the benign group six patients had lesions large enough to study with MRS. Similarly, in the primary progressive group, six patients had at least one lesion of sufficient size to study with spectroscopy. In the patients with multiple sclerosis with relapsing remitting disease (n=9) there was a highly significant reduction of apparent NA (median 8.73 mM, range 6.86 mM-10.74 mM, P=0.0008) from an area of high signal compared with the control group (median 11.97 mM, range 10.55-14.5 mM). The apparent creatine concentration in the same group from an area of high signal was reduced (median 8.3 mM, range 7.0 mM-12.1 mM, P=0.29) compared with controls (median 9.05 mM, range 8.1 mM-11.7 mM) although this did not reach significance. There was no significant difference in the apparent choline concentration between the relapsing-remitting lesion group (median 1.73 mM, range 1.27 mM-2.5 mM, P=1) and controls (median 1.66 mM, range 1.29 mM-1.9 mM) (fig2). 1H MRS (TE 135 ms TR 2000 ms, volume 5ml) from a chronic parietal white matter lesion in a patient with relapsing-remitting multiple sclerosis (patient 12) showing reduction of [NA]. In the patients with secondary progressive disease (n=10),there was again a highly significant reduction of apparent NA (median 7.82 mM, range 3.5 mM-10.3 mM, P=0.0003) from an area of high signal compared with the control group. The apparent creatine concentration in the same group from an area of high signal was reduced (median 7.89 mM, range 4.83 mM-10.3 mM, P=0.1) though again this did not reach significance. There was no significant difference in the apparent choline concentration between the secondary progressive lesion group (median 1.78 mM, range 1.36 mM-2.18 mM, P=0.48) and controls (fig 3). 1H MRS (TE 135 ms TR 2000 ms, volume 4.1 ml) from a chronic parietal white matter lesion in a patient with secondary progressive multiple sclerosis (patient 19) showing reduction of [NA]. In the patients with multiple sclerosis with primary progressive disease (n=6) there was once again a highly significant reduction of apparent NA (median 8.83 mM, range 6.95 mM-9.89 mM, p<0.002) from an area of high signal compared with the control group. The apparent creatine concentration in the same group from an area of high signal was reduced (median 7.39 mM, range 6.47 mM-12.4 mM, P>0.08) although again this did not reach significance. There was no significant difference in the apparent choline concentration between the primary progressive lesion group (median 2.0 mM, range 1.3 mM-2.28 mM, P>0.20) and controls (fig 4). 1H MRS (TE 135 ms TR 2000 ms, volume 5.3 ml) from a chronic parietal white matter lesion in a patient with primary progressive multiple sclerosis (patient 30) showing reduction of [NA]. In the patients with benign disease there was no significant difference in the apparent NA (median 10.5 mM, range 8.53 mM-12.8 mM, P>0.05) from an area of high signal compared with the control group. The apparent creatine concentration in the same group from an area of high signal was reduced (median 7.7 mM, range 5.96 mM-11 mM, P>0.4) although this did not reach significance. There was no significant difference in the apparent choline concentration between the benign lesion group (median 1.75 mM, range 1.08 mM-2.25 mM, P>0.34) and controls (fig 5). 1H MRS (TE 135 ms TR 2000 ms, volume 4.4 ml) from a chronic parietal white matter lesion in a patient with benign multiple sclerosis (patient 6) showing a relative preservation of [NA]. In the patients with primary progressive multiple sclerosis there was a significant reduction of apparent NA from an area of normal appearing white matter (median 8.78 mM, range 8.7 mM-12.38 mM, P< 0.025) compared with the control group (fig 6). The apparent creatine concentration in the primary progressive group from an area of normal appearing white matter (median 8.9 mM, range 6.46 mM-9.49 mM, P>0.5)did not differ from the control group. There was no significant difference in the apparent choline concentration from normal appearing white matter in the primary progressive lesion group (median 1.44 mM, range 0.96 mM-2.53 mM, P>0.14) and controls. 1H MRS (TE 135 ms TR 2000 ms, volume 4.8 ml) from an area of normal appearing white matter in a patient with primary progressive multiple sclerosis (patient 30) showing reduction of [NA]. In the patients with multiple sclerosis with benign disease (n=5), there was no significant difference in the apparent NA (median 10.74 mM, range 8.58 mM-13.4 mM, P>0.3) from an area of normal appearing white matter compared with the control group. The apparent creatine concentration in the benign group from an area of normal appearing white matter (median 9.15 mM, range 8.68 mM-9.76 mM, P>0.9) did not differ from the control group. There was no significant difference in the apparent choline concentration between the benign lesion group (median 1.82 mM, range 1.72 mM-2.28 mM, P>0.12) and controls. It was not possible to collect spectroscopic data from normal appearing white matter in the patients with relapsing-remitting and secondary progressive disease. There are three major findings in this study. The first is the relative preservation of [NA] from lesions in the patients with benign multiple sclerosis compared with [NA] from lesions in the primary progressive, secondary progressive, relapsing-remitting patients, and normal appearing white matter from the control group. The second finding of note is a small but nevertheless significant correlation between the reduction of [NA] from a multiple sclerosis lesion and the degree of disability measured on the Kurtzke EDSS. Finally, this study has shown a reduction of [NA] from normal appearing white matter in the primary progressive group of patients with multiple sclerosis compared with the preservation of [NA] from normal appearing white matter in the benign group of patients with multiple sclerosis and healthy controls. However, an original finding in the present study is the relative preservation of [NA] from lesions in patients with multiple sclerosis with benign disease. The incidence of benign multiple sclerosis varies in different series from between 15% and 40%.3 26 27The pathophysiological mechanisms that lead to a benign course are not fully understood. Studies with MRI in the brain6 or spinal cord28 have shown little or no relation between disability and lesion load. Given that the principal component of NA is N acetyl aspartate, an amino acid almost exclusively localised within neurons and their processes,8 the relative preservation of [NA] from lesions in the benign group may reflect a relative preservation of axons in these lesions. It may be that the less pronounced initiating inflammatory event in benign multiple sclerosis produces less axonal disruption and a preserved capacity for axonal repair. The patients in the primary progressive and secondary progressive groups had a significantly higher median Kurtzke EDSS than the patients in the benign group. It is perhaps suprising that the relapsing-remitting group showed such a large reduction in the median [NA] given that several of the patients in this group had minimal disability. There is, however, a tendency for the patients with minimal disability in this group to have the highest [NA] (fig 7). It is probable that some of the patients in this group will have a benign form of the disease over time and thus would be expected to have a preservation of NA in lesions. An obvious explanation for this finding is that the patients in the relapsing-remitting group who had higher [NA] tended towards a shorter duration of disease (table). [NA] from lesions v Kurtzke EDSS in patients with relapsing-remitting disease. 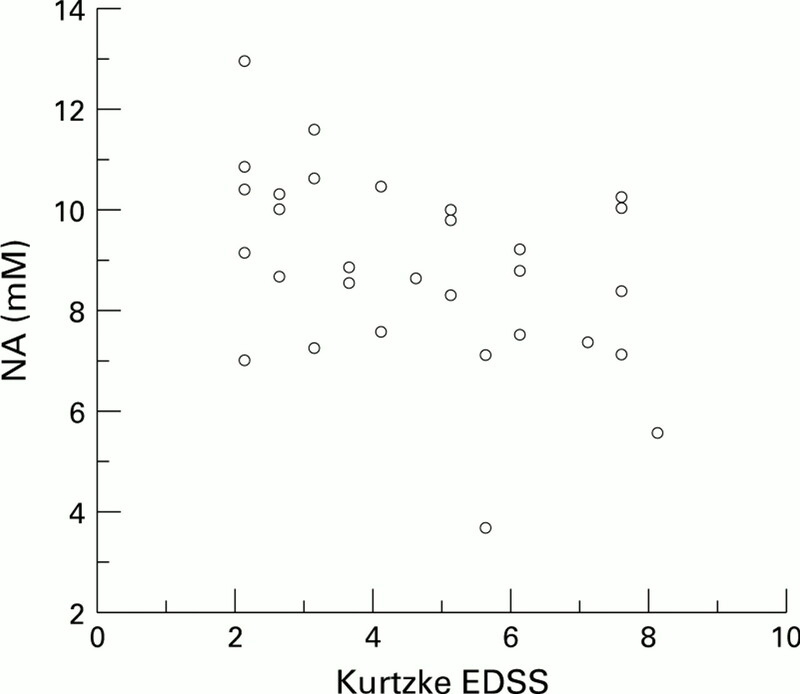 Kurtzke EDSS v [NA] in patients in all subgroups of multiple sclerosis. In the present study there was a tendency for the creatine concentration to be reduced in lesions from all multiple sclerosis groups although this was not significant. This is in keeping with a recent postmortem study by Davies et al 36which showed an absolute reduction of both NA and creatine from multiple sclerosis lesions studied 48 hours after death whereas areas of normal appearing white matter studied showed normal metabolite concentrations. There was no significant difference between the creatine concentration from normal appearing white matter in the benign and primary progressive patients compared with controls. The present study has shown a reduction in [NA] from lesions in those subgroups of patients with a greater degree of clinical disability. By contrast, patients with benign multiple sclerosis showed a preservation of NA from lesions and normal appearing white matter indicating a less destructive pathological process in this patient group. Patients with primary progressive multiple sclerosis showed, in addition to a low [NA] from lesions, a reduction of [NA] from normal appearing white matter, perhaps indicating a more diffuse pathological process in this subgroup. Some of the patients in the relapsing-remitting group who had minimal disability showed a preservation of [NA]. These patients tended to have a shorter duration of disease. It therefore cannot be concluded that spectroscopy of lesions is predictive of clinical outcome in patients with relapsing-remitting multiple sclerosis. The findings from the present study, however, are of enough interest to pursue this issue further. With the advent of β-interferon, an agent that reduces the frequency of evidence of new disease activity in early relapsing-remitting multiple sclerosis37 38 it has become more necessary to find a reliable means of predicting clinical outcome at an early stage of the disease. A future longitudinal spectroscopic trial of patients with relapsing-remitting disease with minimal clinical disability and a wide range of duration of disease should provide the answer to whether spectroscopy could be a useful tool for this purpose. This work has been generously supported by a grant from the Multiple Sclerosis Society of Great Britain and Northern Ireland. Software for spectroscopic analysis was provided by General Electric (GE Milwaukee, WI, USA). (1992) Serial gadolinium-enhanced MRI in relapsing-remitting multiple sclerosis of varying disease duration. Neurology 42:60–63. (1991) Major differences in the dynamics of primary and secondary progressive multiple sclerosis. Ann Neurol 29:53–62. (1961) The benign form of multiple sclerosis. A study based on 241 cases within three years of onset and followed up until the tenth year or more of the disease. Brain 84:186–203. (1994) The benign form of multiple sclerosis: MRI evidence for less frequent and less inflammatory disease activity. J Neurol Neurosurg Psychiatry 57:1070–1072. (1984) Lack of correlation between clinical manifestations and lesions of MS seen by NMR [abstract]. Neurology 34 (suppl 1) S136. (1990) Patterns of disease activity in multiple sclerosis: clinical and magnetic resonance imaging study. BMJ 300:631–634. (1989) N-acetyl-L-aspartic acid: a literature review of a compound prominent in 1H-NMR spectroscopic studies of brain. Neurosci Biobehav Rev 13:23–31. (1993) Proton nuclear magnetic resonance spectroscopy unambiguously identifies different neural cell types. J Neurosci 13:981–989. (1995) Differentiation of multiple system atrophy from idiopathic Parkinson’s disease using proton magnetic resonance spectroscopy. Ann Neurol 37:204–210. (1992) Early time course of N acetylaspartate, creatine and phosphocreatine, and compounds containing choline in the brain after acute stroke. A proton magnetic resonance spectroscopy study. Stroke 23:1566–1572. (1992) 1H and 31P magnetic resonance spectroscopy of brain degenerative cerebral disorders. Ann Neurol 31:202–211. (1993) Proton spectroscopy of the brain in HIV infection: correlation with clinical, immunologic and MR imaging findings. Radiology 188:119–124. (1983) New diagnostic criteria for multiple sclerosis: guidelines for research protocols. Ann Neurol 13:227–231. (1987) Localised proton spectroscopy using stimulated echoes. J Magn Reson 72:502–508. (1990) Improvements in localised proton NMR spectroscopy of human brain, water suppression, short echo times and 1ml resolution. J Magn Reson 290:464–473. (1993) In vivo quantification of brain metabolites by 1H-MRS using water as an internal standard. Magn Reson Imaging 11:107–118. (1992) Magnetic resonance imaging in parkinsonism. Neurol Clin 10:405–420. (1995) Signal intensity on MRI of basal ganglia in multiple sclerosis. J Neurol Neurosurg Psychiatry 59:306–308. (1966) Subacute sclerosing leukoencephalitis. II. Chemical studies including abnormal myelin and an abnormal ganglioside pattern. J Neuropathol Exp Neurol 25:582–597. 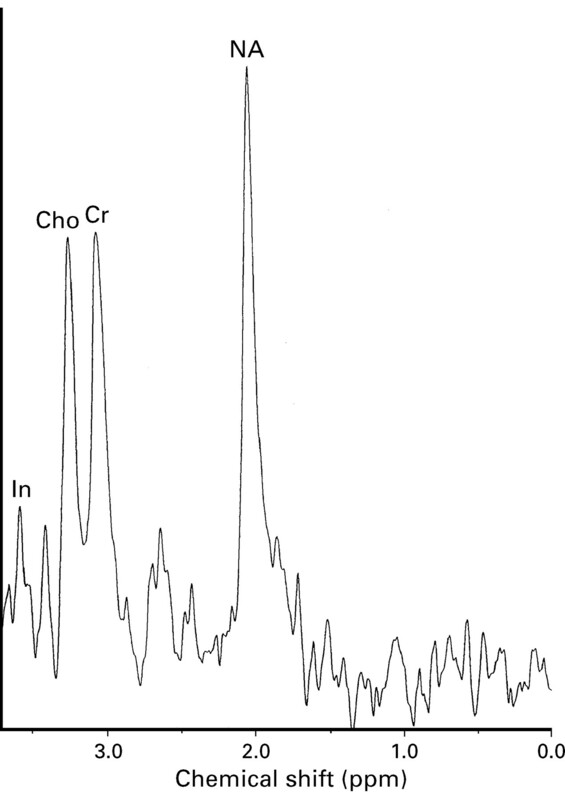 (1989) Localised proton NMR spectroscopy in different regions of the human brain in vivo. Relaxation times and concentrations of cerebral metabolites. Magn Reson Med 11:47–63. 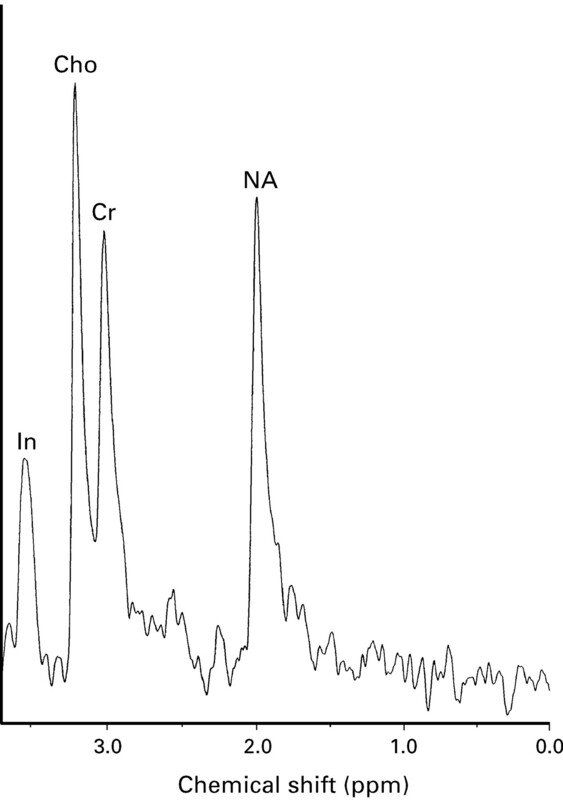 (1991) Assignment of resonances in the 1H spectrum of rat brain by two-dimensional shift correlated and J-resolved NMR spectroscopy. Magn Reson Med 17:285–303. (1990) Proton magnetic resonance spectroscopy of human brain in vivo in the evaluation of multiple sclerosis: assessment of the load of disease. Magn Reson Med 14:154–159. (1991) Proton magnetic resonance spectroscopy of an acute and chronic lesion in multiple sclerosis [letter]. Lancet 337:58–59. (1994) Biochemical alterations in multiple sclerosis lesions and normal appearing white matter detected by in vivo 31P and 1H spectroscopic imaging. Ann Neurol 36:157–165. (1995) Persistent functional deficit in multiple sclerosis and autosomal dominant cerebellar ataxia is associated with axon loss. Brain 118:1583–1592. (1980) Course and prognosis of multiple sclerosis assessed by the computerised data processing of 349 patients. Brain 103:281–300. (1986) A clinical and laboratory study of multiple sclerosis. Q J Med 58:69–80. (1993) Spinal cord MRI using multi-array coils and fast spin echo. II. Findings in multiple sclerosis. Neurology 43:2632–2637. (1992) Proton magnetic resonance spectroscopic imaging for metabolic characterisation of demyelinating plaques. Ann Neurol 31:235–241. (1983) Atypical and clinically silent multiple sclerosis: a report of 12 cases discovered unexpectedly at necropsy. J Neurol Neurosurg Psychiatry 46:414–420. (1989) Correlation of magnetic resonance imaging with neuropsychological testing in multiple sclerosis. Neurology 39:161–166. (1993) A serial study of psychometric and MRI changes in multiple sclerosis. Brain 116:569–602. (1995) Chemical pathology of acute demyelinating lesions and its correlation with disability. Ann Neurol 38:901–909. (1994) Serial proton magnetic resonance spectroscopy in acute multiple sclerosis lesions. Brain 117:49–58. (1991) Pathology of multiple sclerosis. in McAlpine’s multiple sclerosis. eds Matthews WB, Compston A, Allen IV, Martyn CM (Churchill Livingstone, Edinburgh), 2nd ed. pp 341–378. 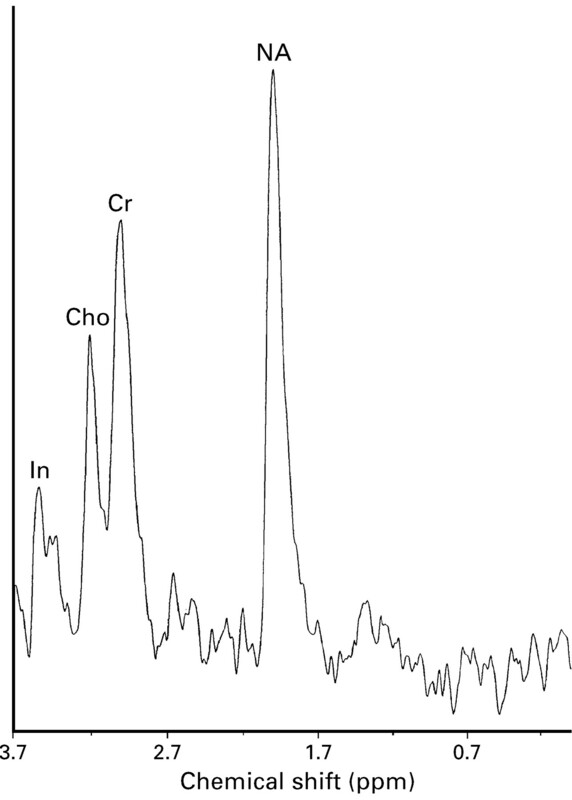 (1995) High resolution proton NMR spectroscopy of multiple sclerosis lesions. J Neurochem 64:742–748. (1993) Interferon beta-1b is effective in relapsing remitting multiple sclerosis. I. Clinical results of a multicenter, randomized, double-blind, placebo-controlled trial. Neurology 43:655–661, . Comment in: Neurology 1993;43:641–3..
(1988) MRI in the diagnosis of MS: a prospective study and comparison of clinical evaluation, evoked potentials, oligoclonal banding and CT. Neurology 38:180–184.